Activision Blizzard (NASDAQ:ATVI) recently posted a better than expected Q1 performance with a 14% jump in sales, led by strong performance of the Activision segment. The company’s other segments also did well with a high-single-digit growth in Blizzard, and low-double-digit growth in the King segment. Looking forward, the company will release World of Warcraft: Battle for Azeroth, and Call of Duty: Black Ops 4 later this year. This should aid the company’s overall growth in the near term, and beyond, given that these are very strong franchises with a solid active user base. We have created an interactive dashboard of the company’s expected performance in 2018. You can adjust the revenue and margin drivers to see the impact on the company’s performance. 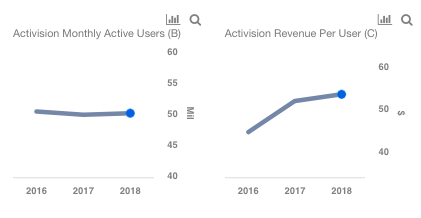 The Activision segment saw a solid 45% growth (y-o-y) in net revenues in Q1, primarily led by Call of Duty: WWII, which was released in November 2017. The growth was also aided by Call of Duty: Black Ops III. Looking forward, the company plans to release Call of Duty: Black Ops 4 later this year, and this will likely aid the segment growth. We estimate the average active monthly users to be around 50 Mil, and average revenue per user to be $53 for 2018. This translates into segment revenues of $2.7 billion, reflecting 3.50% growth as compared to the prior year period. Blizzard segment revenues grew 8% in Q1, led by World of Warcraft, and the Overwatch League. The company plans to release World of Warcraft: Battle For Azeroth in the second half of this year, which will likely aid the segment growth. We forecast a 14% segment revenue growth in 2018, primarily due to a strong growth in monthly active users, which will likely trend higher with the Battle For Azeroth release. In the long run, we expect the Blizzard segment to drive growth driven by a strong Blizzard lineup, and rising popularity of e-sports. Looking at the King segment, Q1 revenues grew around 12% led by Candy Crush Saga. The Candy Crush franchise is on a strong run, and holds number one and number two grossing mobile spots in the U.S. We expect low-single-digit growth for this segment in 2018, aided by advertising revenues. However, the company is facing a decline in the monthly active user base. It stood at 285 million in Q1, as compared to 342 million in the prior year period. We expect the average monthly active user base for 2018 to be around 305 million. Overall, Activision Blizzard’s Q1 results were better than street estimates, and the company also raised its revenue guidance to $7.35 billion. We believe that the company’s near term growth will be led by its robust lineup of releases under its strong franchises, and forecast an adjusted earnings of $2.62 for 2018. Having said that, our current price estimate of $72 is close to the current market price, and the stock is fairly priced at the current levels.